I am trying to get more good fats into my diet and less bad fats. So I liked this recipe which uses avocados and seafood combined for a great Spring flavor boost. This recipe is easy for a brunch and can be easily doubled or even tripled. Bring a small saucepan of water to a boil. Add scallops and cook until firm, opaque and just cooked through, about 1 minute. Drain and rinse under cold water until cool. Slice 1/4 inch off the bottom and top of the grapefruit; stand it on a cutting board. Using a sharp paring knife, remove the peel and pith. Hold the fruit over a medium bowl and cut between the membranes to release individual grapefruit sections into the bowl, collecting any juice as well. Discard membranes, pith, peel and any seeds. Transfer just the grapefruit sections to a serving bowl. Whisk shallot, vinegar, mustard, salt and pepper into the bowl with the grapefruit juice. Whisk in oil in a slow, steady stream. Add the scallops and crab to the dressing; toss well to coat. Add lettuce, tomatoes and avocado to the bowl with the grapefruit sections; toss to combine. Add the seafood and dressing; toss gently. 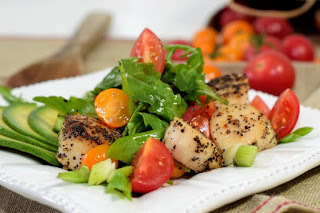 Note: Be sure to request "dry" scallops (i.e., not treated with sodium tripolyphosphate, or STP) from your fish store. Sea scallops that have been subjected to a chemical bath are not only mushy and less flavorful, but will not brown properly. Each month a theme is chosen and a number of recipes on that theme from my massive archive will be shared. This year we have 12 new topics, different from the topics of last year. To find the recipes of last year, check out this recipe link or search the blog with the topic Recipe2018. You can search the monthly theme by looking for the theme keyword in the search box and it will pull up the recipes on that theme as posted, so look at the bottom of the recipe in each posting for the KEYWORD in the () to search for each month. All recipes this year will be tagged Recipe2019 so you can find them all. 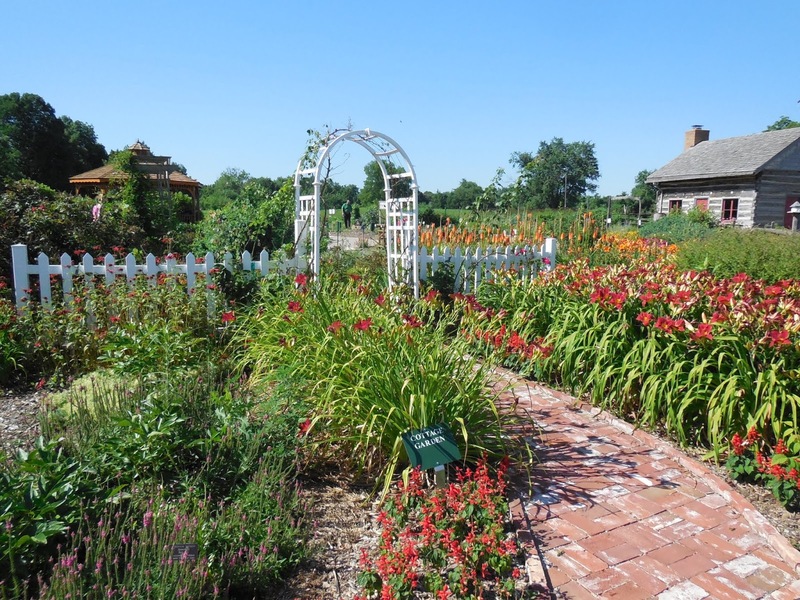 Just so you don't think I have only visited gardens in Indiana I thought today I would explain a garden I visited back in 2013 right here in my home state of Illinois. I was using my first digital camera that had useful pixels that actually took photos that look good posted anywhere. Before that the images are so grainy from my 3 or 5 pixel cameras, that I am embarrassed to share most of them. This is the Klehm Arboretum and Botanic Garden located in Rockford, Illinois. We stopped by on an early June day back in 2013 when the weather was balmy and sunny and the plants were just hitting their late spring flush. We were out on a road trip to enjoy the lovely day and stopped by when we saw the sign. I was fascinated with the Children's garden that is dotted with fun interactive ideas and bright colors. I think A to Z gardens are such fun, you often find them in Children's gardens, but as an adult I love the organization of them and the choices the gardeners use for each letter often takes me on fun adventures. I took way too many photos of the A to Z garden, so I will just share the end of the alphabet with my favorite flower - Zinnia! If you want to see the details, check out my post from 2013. A tower in the Children's garden area allowed us to get a bird's eye view of all the fun. They also had a human sized sundial which worked perfectly on that sunny day to tell the correct time of 10:00 AM. and visiting the Demonstration Gardens gave me lovely landscaping ideas. There was a maze -- love a good maze. 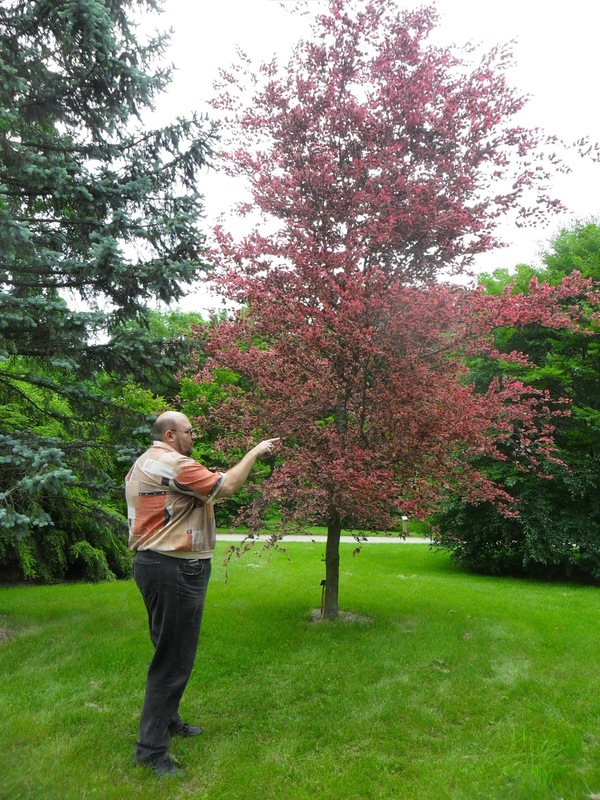 A number of flowering and ornamental trees were also part of the experiences in the arboretum. 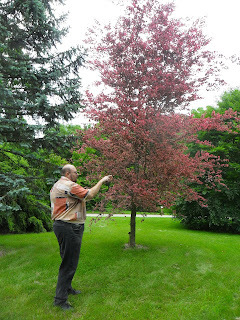 Here is hubby pointing at -- I have no idea. We were there on bring your dog to the arboretum day and we got a lot of comments from visitors asking where our dog was and joked with a couple about being the only folks there without one on that day. The entrance to the Arboretum with the fountains is really striking and a great wedding venue. The admission is reasonable and they do have a reciprocal program if you are a member of another arboretum. We just had a wonderful experience walking through the place and catching all the lovely touches they have included in the landscape. Like these edible flowers! So if you are traveling though northern Illinois, visit the Klehm Arboretum and Garden located at 2715 S. Main Street in Rockford, Illinois. 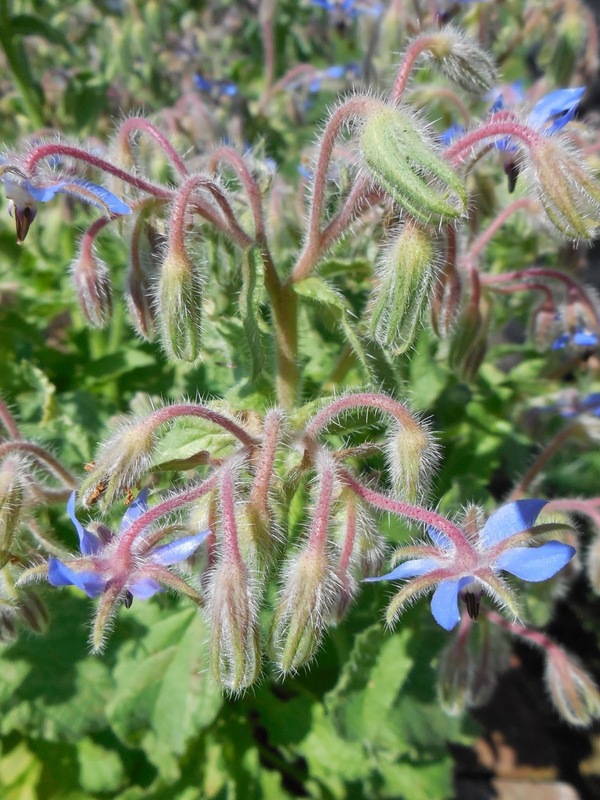 The next garden in the National Garden Month post is here. 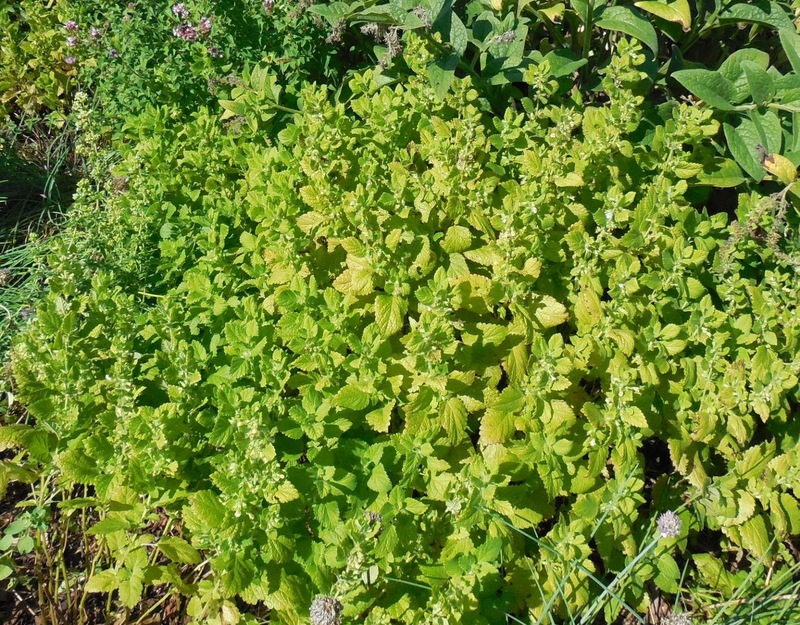 We did a detailed post on Cinnamon Basil back in 2013, however since that time I have discovered a number of new ideas for using it, so I thought I would share that as a Mini Herb of the Week. 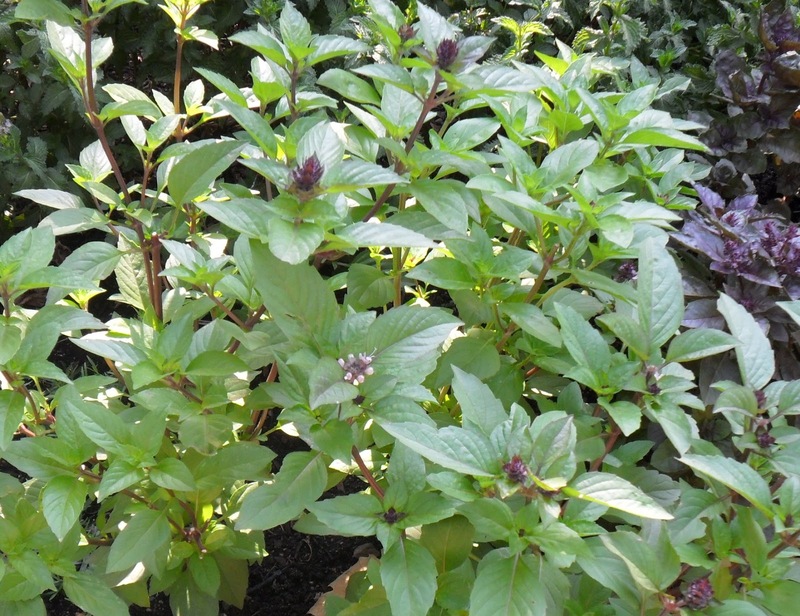 Cinnamon Basil has lovely purple edges and purple stems making it a joy to have in the garden from a visual stand point, then you have the cinnamon scent and this is just a bonus. The subtle cinnamon flavor with a hint of basil goes with both sweet and savory dishes. Combine all ingredients in food processor or blender. Process until mixed, scraping down sides. Makes 1 1/2 cups. Got this recipe from the mystery book Indigo Dying, by Susan Wittig Albert. You can use it as a syrup on French toast or pancakes or even waffles, but it is also great in tea, especially Chai. In a saucepan, gently heat together honey, spices and brandy. 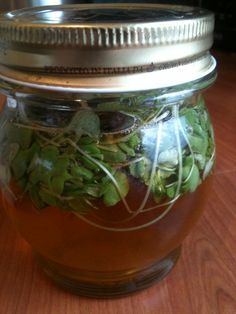 Put the basil sprigs into a sterilized jar and pour the hot honey mixture over it. Cover and allow the flavor to mellow for about a week. 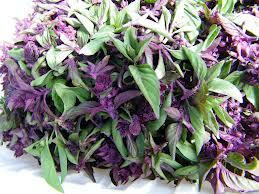 In a bowl, combine the sugar, ginger, cinnamon basil and oil. Mix vigorously with a fork until fully combined. Let the mixture sit until the sugar has settled to the bottom of the bowl (about an hour). There should be a thin layer of oil covering the mixture. If you need to add more oil, do it now. Scoop the mixture into an airtight container. Make sure that the containers you choose seal completely, so the mixture doesn’t dry up. Directions to Use the scrub: While in the shower or at the sink, apply the scrub to damp skin and scrub gently. Rinse with warm water. In August 2016 my husband took me on a road trip when we were quite a ways from home we decided to spend the night and go home the next day. On the voyage home we stopped in Peoria. It was raining, so we decided to go to the Luthy Botanic Garden and Conservatory because the building was indoors, so I could look at plants in a heavy rain. While we were there, the rain stopped and I was able to take in the Herb garden and the other outdoor displays. The Luthy Botanic Garden opened in 1951 and is run by the Peoria Park District. It off the main road on a side street you would never guess was taking you to a glass conservatory set among trees and flowers. Living in Illinois I do not get the chance to grow or enjoy many tropical plants so I was fascinated with the offerings inside the Conservatory. The Bird of Paradise was in bloom and I must have taken 30 pictures of it trying to catch the best view of the blooms. There were plants I'd never known about like the miraculous plant that changes your tastebuds (temporarily) to make sour things taste sweet called Miracle Berry. There were blooming orchids and other tropical plants I cannot identify that have exceptional flowers. There were banana and plantains almost ready to be harvested. And this lovely variegated shrub that I think I know the name of? There were umbrellas made available that we used to go outside when the rani slowed down. This is Hubby approaching a green house that I am guessing was the original 1951 era conservatory. Tucked away under the trees in the outdoor area was a children's garden. Some of it had been put to bed for the year, but there was the cutest train and other fun garden art and play areas. There was a lovely display garden of Dwarf Conifers installed in 1997. Now to the herb garden. This was a pretty garden tucked along the side of the conservatory that had a metalwork entrance arch that spelled out "Herbs." The center sported a sundial and the formal four square layout had a variety of herbs and garden art to explore and enjoy. The garden included Lemon Verbena and Rosemary planted in the ground, looking like they wintered over in place. I was curious if this was true, but no one working that day was well versed in herbs to be able to answer that inquiry. There were some unusual plants like Lungwort, Hyssop and Rue. Being August the Garlic Chives were ready to bloom. There was a bush of Meadowsweet an herb I would like to grow when I have more room for it to spread out like this one has. 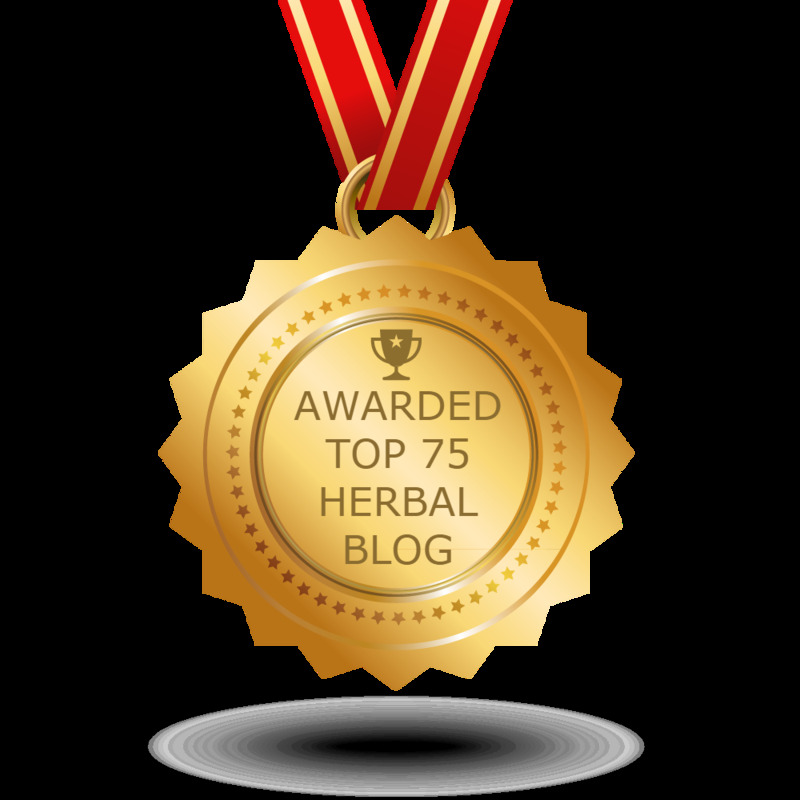 The herb is a go-to for stomach and intestinal ailments and can be used in tinctures as well as dried and taken in tea form. I don't have another picture of it, but you can see the willow branches placed diagonally in the ground to the right of the Meadowsweet that were keeping other herbs like Yarrow from creeping into the space. I thought it was clever and not at all distracting. There was a Costmary (Bible leaf) plant. This lastly minty smelling and tasting leaf can be sniffed to increase wakefulness. And the most interesting Thyme Bed -- Sofa? A most clever way to display Thyme and a perfect memorial sculpture - a scented seat. The "planted seat" is an old herb garden item, used often before the 1800s to scent clothing. It was created of carved stone, much like a heavy church pew. The seat was hollowed out into a cavity about 6 inches deep and into this was packed earth planted with either chamomile or thyme. When a person sat down and crushed the plants, resulting oils soaked into breeches or skirts. The seat would be replenished as needed. 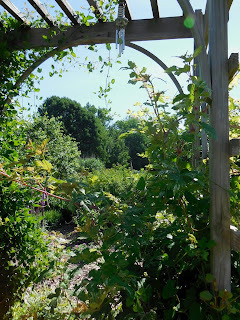 I did not notice the arch with HERBS until I was leaving the herb garden as I entered from the back side like this view. The sundial in the center is registered with the North American Sundial Society is said to be only one of two designed by Grant Hood of the Bradley It is inscribed "TIME FLIES LAT 40 43 DESIGNED BY GRANT HOOD, PEORIA, ILL." The granite pedestal includes a dedication plate reading, "Presented by - Mrs. S. A. Kinsey - October 1905" Grant Hood worked for Parson School of Horology (founded in 1886.) Horology is the study of watchmaking and time keeping the school was part of what is now Bradley University in Peoria. The other sundial was at the school but was later removed and sold. Preheat oven 450 f. Lightly coat a sheet pan with cooking spray. If using frozen fish, make sure it is defrosted. You will need a dish for the eggs, a dish for the flour, and a dish for the shredded potatoes. Toss together the grated potatoes, bread crumbs, herbs and seasonings. In a fry pan, heat about a cup of oil on medium/med high heat. Dredge fish in flour, shake off excess then dip in egg and let excess drip off. Crust the fish in the potato mixture, pressing to adhere. Add encrusted fish to hot oil. Cook to brown the potatoes to crispiness. Flip and brown the other side. Drain on paper towel. 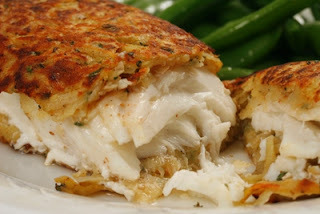 Place browned fish on greased or parchment lined pan and bake in oven for about 5-8 minutes until cooked through. This time I have images from an unexpected discovery in Southern Indiana in Evansville, IN. During the fourth of July weekend in 2014 we went on a road trip and stopped at a number of places. We were going down there to tour an LST (that is Landing Ship Tank a troop and equipment transport from World War. We stayed at a and drove into several times on each trip we drove by what looked like a garden area set way back from the main road. I could not see what it was exactly but finally after we were finished with the reason for the trip, we were passing by it again and I turned to my husband and said, I need to know what that is, can we stop? My thought was that it might be a community garden, but it was not exactly that. They had been part of the annual garden walk a few weeks previous, so the garden was in its glory. This was another garden with vignettes. 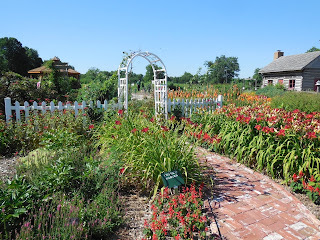 There was Cottage Garden, a log cabin, Frontier garden, a American Winners display area, and a wonderful Herb Garden complete with a thyme covered path and an arbor that was such a striking image that I must have taken a dozen photos of it. The Cottage Garden, although without a cottage was well crafted and had a wonderful variety of plants and flowers. There was a gazebo and a section with vegetables plants that according to signage provided produce for the local shelter and a school foodways program. We wandered around for quite sometime as the plants were just perfect for enjoying and photographing and the weather was not too hot. 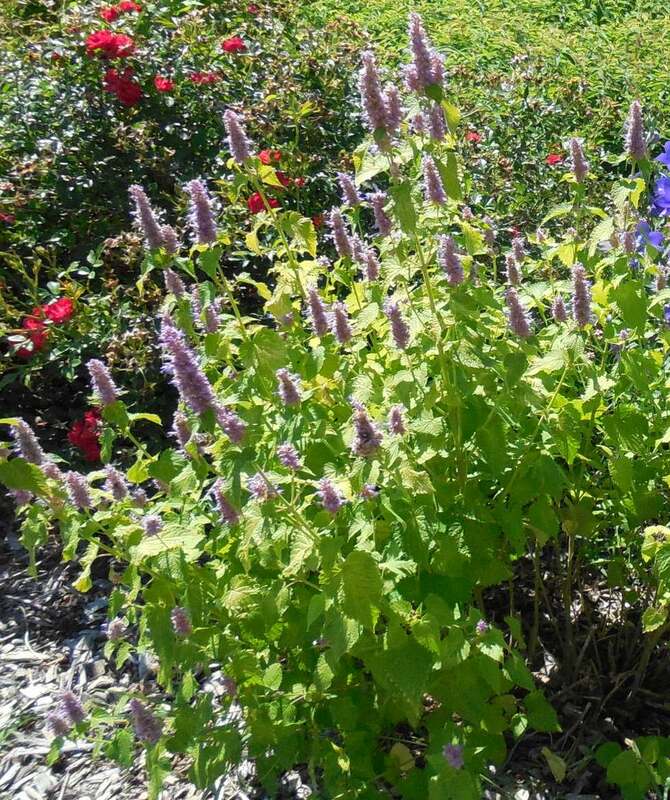 This Anise Hyssop is called Golden Jubilee with a great yellow green color to the leaves. Their Borage was flowering with abandon and I wanted desperately to harvest it, but-- not my garden. 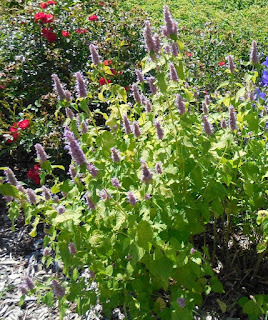 This Speedwell was a golden color called Veronica Aztec Gold. Someone loved gold plant varieties like I do which only made me happier to have stopped. 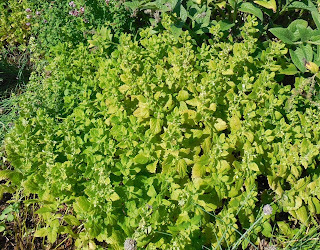 This is a golden Lemon Balm which I have wanted to acquire for a long time. 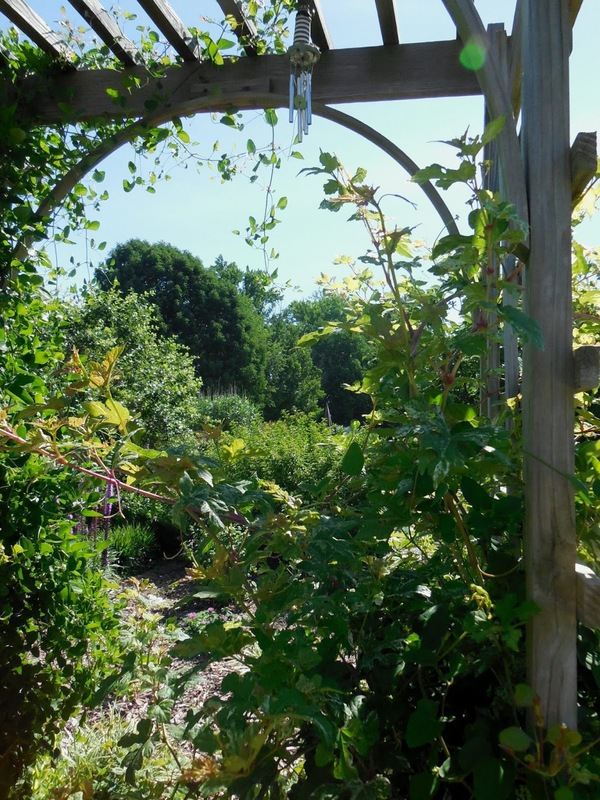 The grounds were criss-crossed by paths that allowed you to wander around and enjoy the various garden spaces and circle back to see them more than once. 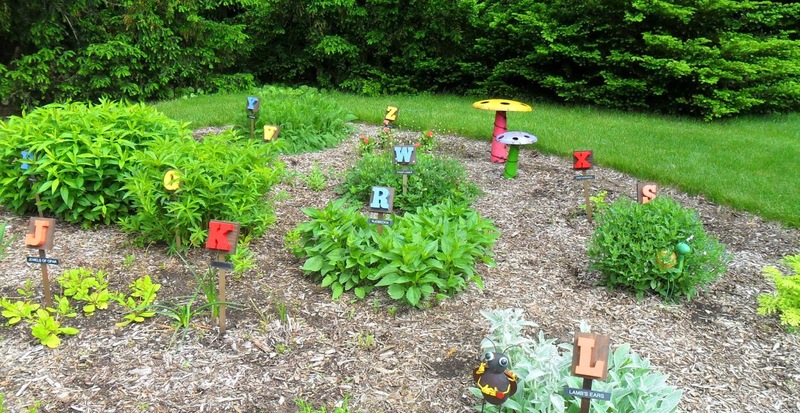 The best thing about this garden was that the plants were well marked. I could find out the species and the variety for many, which was great for making a plant wish list. They used several types of markers. This one identified this plant as Creeping St. John's Wort. A new plant for me. There were Sunflowers, Oat Grass and Seagrass, as well as new echinacea hybrids and a nice selection of shrubs around the gazebo. 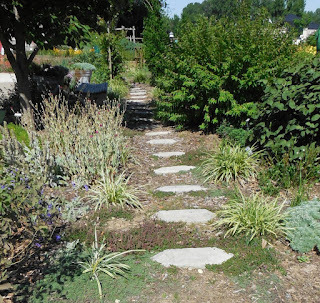 And one of my favorite parts of the garden, was the walking path with several varieties of creeping thyme all in flower. I walked back and forth through here for more time than my husband had tolerance for. He escaped to the gazebo to wait for me to stop stroking the plants. The website for the Southwest Indiana Master Gardener Association has details for all their programs, upcoming activities and history of the garden and club. There have been some additions to the garden since I visited in 2014 which might draw me back to see it again. They have added a sensory garden which I am sure is full of herbs and scented plants. 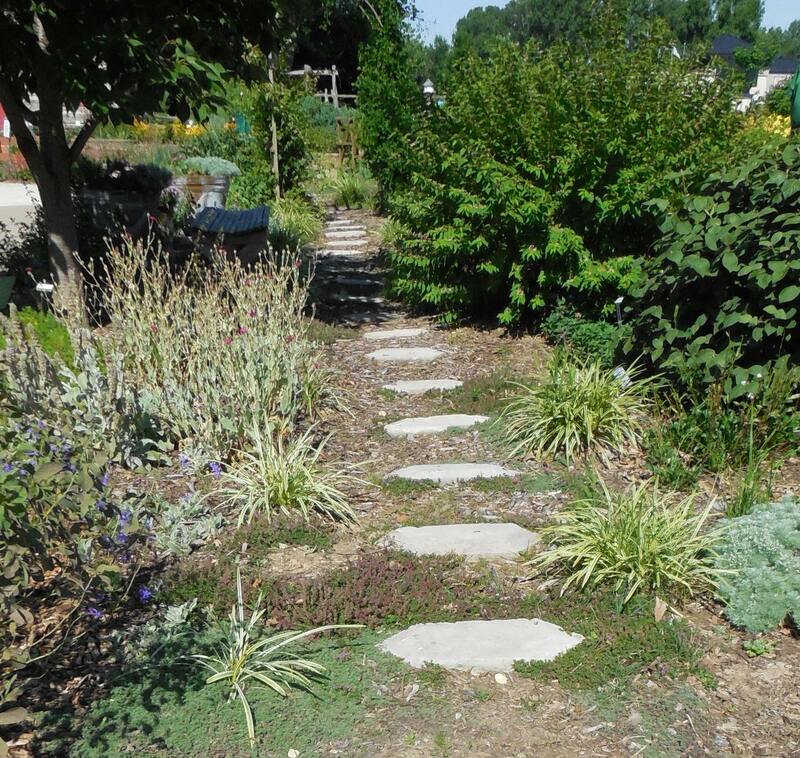 If you visit Evansville, Indiana, I recommend stopping to see this garden located beside the Eykamp Boy Scout Center at 3501 E. Lloyd Expressway in Evansville, IN. 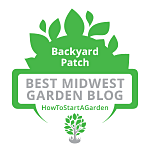 The next post for National Garden month is here. 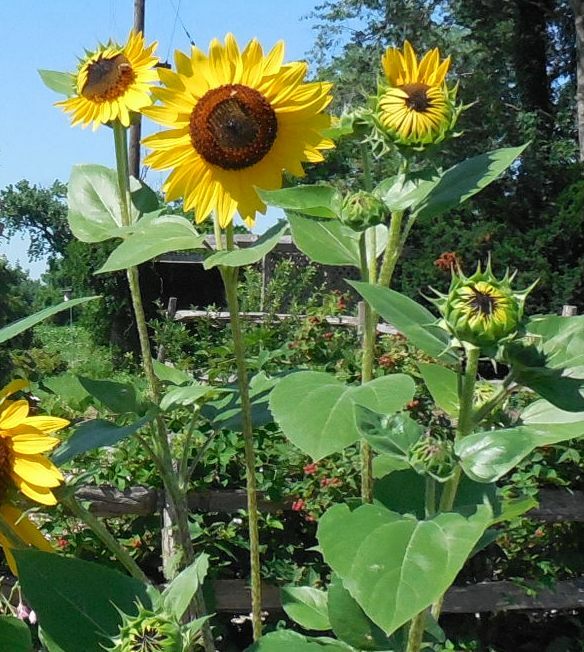 Our previous post on the Elkhart, Indiana Wellfield Botanic Garden is here.